COLUMBINE is one of the most exciting - yet realistic projects we have come across. We consider her worth now substantially attributable to Alex Laird, whose respect for such vessels of this vintage and extensive knowledge have put him in the vanguard of classic yacht revival over the last 20 years. The hard work he has already applied combined with the enthusiasm and innate good taste of her owner have yielded frankly an almost incredible platform for completion by someone appreciative of COLUMBINE both as she is and as she can become. This is of course supported by the extent and quality of the materials and period fittings available - so assiduously collected by an owner with a thirst for all things beautiful – and wherever possible; original. 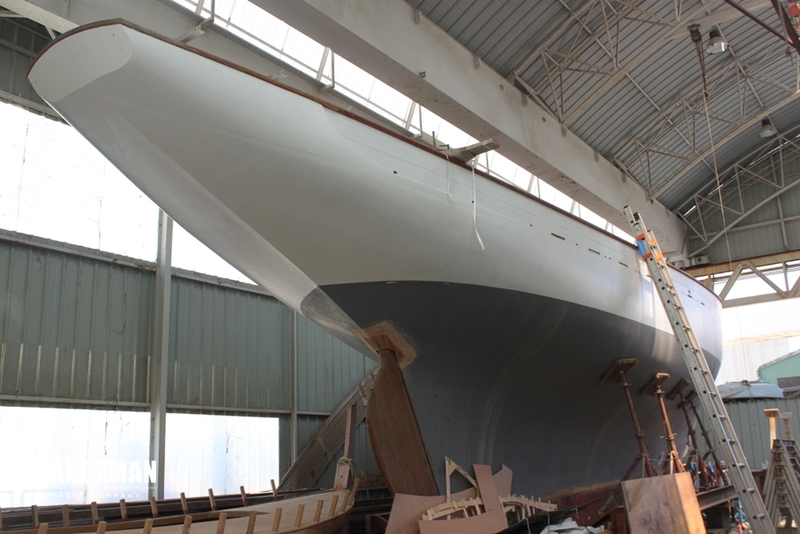 In 2001 the owner moved COLUMBINE by road transport to the south of France since when she has been undercover in the boatyard workshop of Classic Works in La Ciotat, The hull and deck is complete and the rudder is built but requires the bronze bearings and tiller to be fitted. 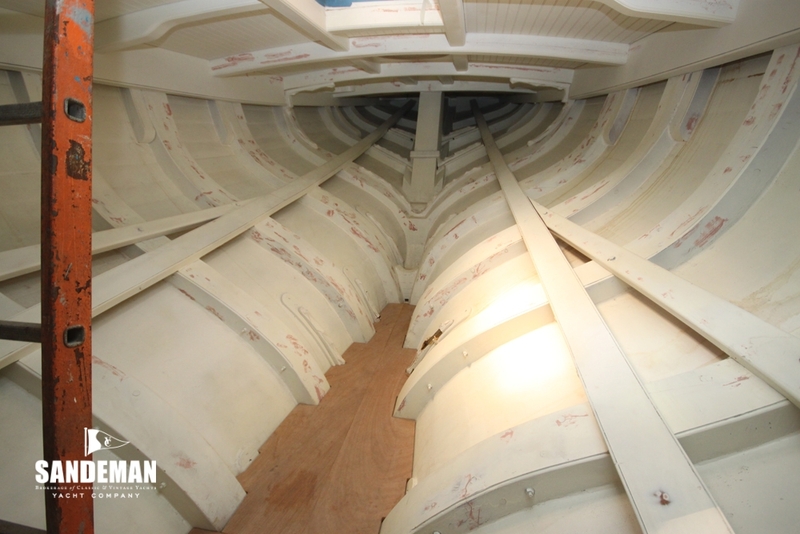 Although an accurate and detailed mock up of the interior has been made, she is not fitted out inside: no tanks, masts, spars apart from bowsprit, sails, rigging, chain-plates, deck fittings are all to make – or where listed as available to fit. Specially selected timber and much hardware is available. The Hercules Hydraulic Pod system combines the quiet reliability of hydraulic drive with the technical innovation of exterior mounted pod drive and must surely be the most suitable and most maintenance free drive system available for classic yachts. 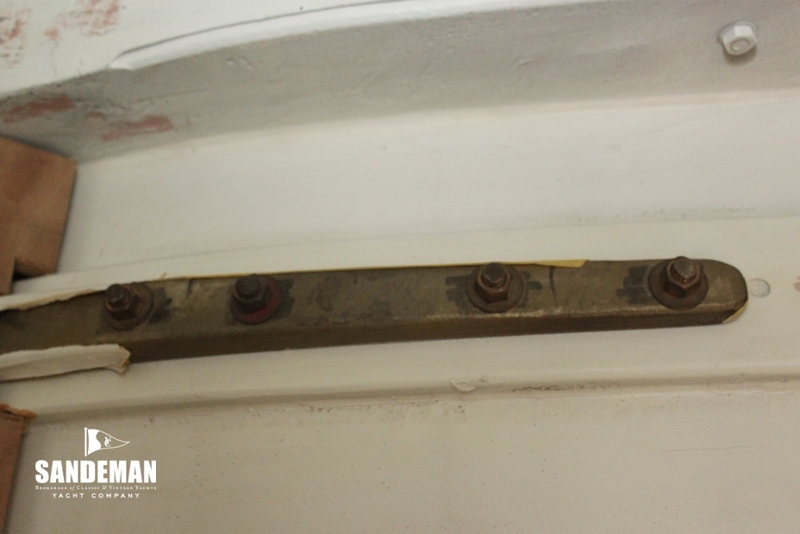 The port and starboard drive mounted on the exterior of the hull provide maximum manoeuvrability and the potentially troublesome alignment of the prop shaft is not an issue as there isn’t one. The powerhouse of the system is a brand new marinised Kubota diesel - as used by Beta, an engine originally developed for farm tractors so spare parts are readily available all over the world. More technical information can be found on the Hercules Systems website. The following is a catalogue of materials, hardware, components and accessories that come with COLUMBINE. The list is not complete but includes the most valuable and important items. An entire teak tree used for laid teak deck, solid teak hatches and the massive teak capping rail. A 1912 article in Yachting Monthly about the beautiful yawl - SILVER FOAM as then named describes a "mahogany panelled saloon with green plush (velvet) upholstery”. The African mahogany selected was chosen for the vividness of the flame in the grain and the richness of colour. 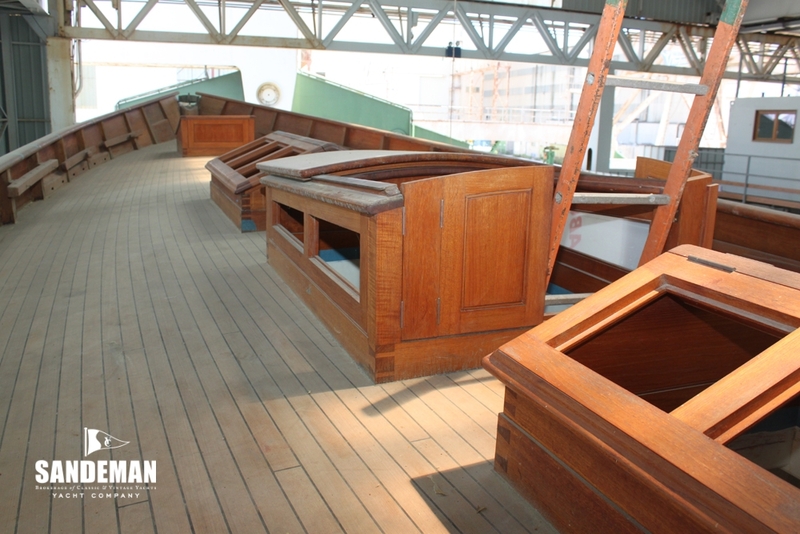 Enough was purchased to panel the entire interior; lobby, saloon, captain's cabin, owner’s stateroom, and forepeak in panelling of a raised and fielded detail. This knot free, peerless Oregon pine was acquired in enough quantity to make all the spars. The exquisite bowsprit has already been made, leaving the main mast (solid), boom, gaff boom, topmast, mizzen mast and mizzen gaff still to be made from the same stock. The original solid brass compass binnacle with ornate and original brass mounting screws; identifiable in Beken of Cowes pictures dates from 1884. Some history exists on COLUMBINE thanks to the considerable interest taken in her by the late John Leather (1928– 2006), naval architect and notable historian - attributable in part to a family connection in the early life of the vessel and enhanced by his own abiding enthusiasm. The following is extracted from notes that he wrote in the late 1980s. 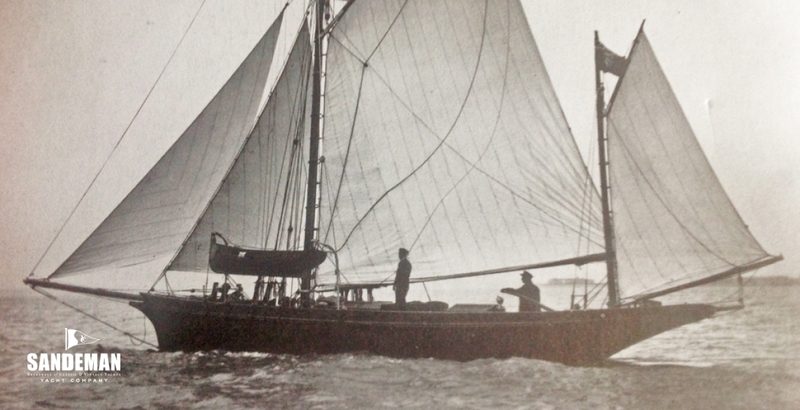 The larger one at 90 ft overall was designed for racing by GL Watson and built by J & G Fay of Southampton for William Paget, a serial yacht owner and racer continuing in that family tradition more than 100 years – even then. Passing through numerous owners; that COLUMBINE did not however enjoy a long life but was to be broken up in 1907 “for the value of her lead” as they used to say. “This handsome yacht has twice crossed the path of my family. About 1912 she was fitting out for cruising under her new London owner a Mr G Modin, whose skipper was from the Colne. Amongst his small crew of 2 hands he picked my mother’s older brother William Barnard, then a young seaman of the Rowhedge breed of smart yacht hands and good fishermen…… William was brought up in yachts and smacks, in sail and the ways of seafaring. 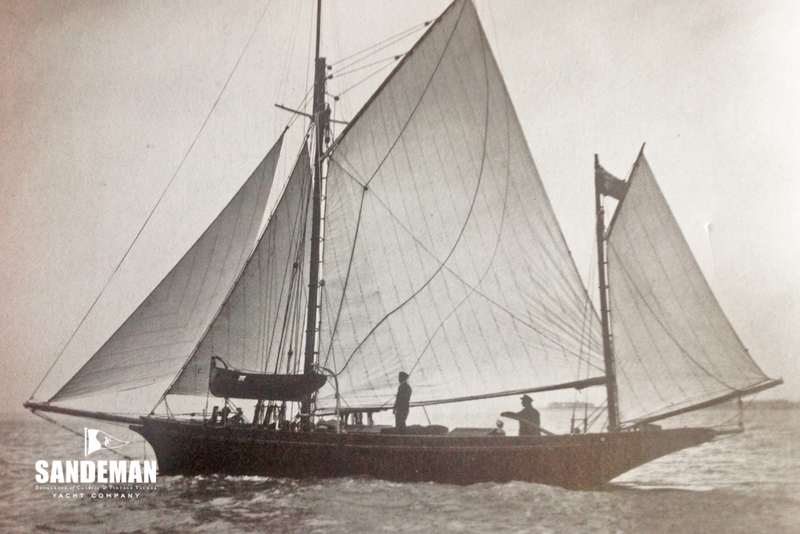 The yacht was already renamed SILVER FOAM by 1900 – then owned by Londoner WR Freeman. In 1905 she passed to Albert Spooner of Shirley Southampton and two years later to Albert Finke of Leatherhead, who still kept her in the Southampton area. It was in the autumn of 1912 that she was bought by Mr Modon, for whom William had crewed. Leather continues: “Modin made some considerable alterations to the accommodation. A 2 cylinder c 12 HP paraffin engine made by Dixon Brothers and Hutchinson of Hythe was installed as was then being done for many sailing cruising yachts. This was a quarter propeller arrangement with the engine fitted in the sail locker under the shallow cockpit. She made 5 knots under power in smooth water…….From forward she had a foc’sle with the usual locker seats on each side with three pipe cots slung above for skipper and hands. The coal fired cooking range was at its aft end and the chain cable was stowed under. A circular hatch led to the deck. Aft was the saloon with polished mahogany joinery and green plush upholstery. It had full headroom and was lit by a skylight; one of two on deck with the main accommodation hatch between. There was a ladies cabin aft and the sail locker abaft that, extending into the counter. This was a very typical arrangement for such a cruising yacht. A speaking tube led from the owner’s cabin to the focs’le for use in bad weather – or to speak to the steward or captain. She had a lead ballast keel of 7 tons and a further 7 tons of lead ingots in the bilge. Mr Modin seems to have owned SILVER FOAM until 1924. She was then bought by Arthur G Emons of Colchester, who I believe kept her at Brightlingsea. In 1939 she was owned by G Rex Gifford and laid up in a mud berth at Wivenhoe. After the 1939-45 war three young men came to look at her. 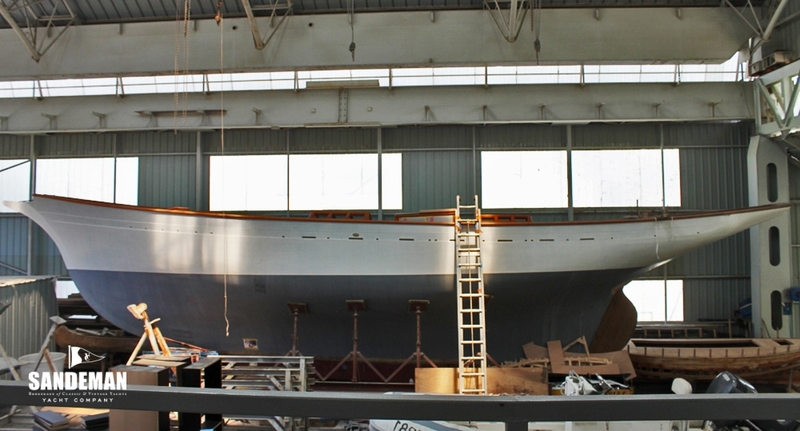 They talked of refitting the old yacht (by then 55 years since her launch and having had her lead keel stripped for munitions) and perhaps of sailing her to the South Seas or around the World. They bought her at Wivenhoe and walking along the quay one day at high water I stopped to look at SILVER FOAM and told her new crew of Uncle William’s time in her. They invited me on board and I looked over cabins and compartments little altered since his day. The focs’le with its pipe cots looked as if the hands had just laid her up for the winter but the green plush in the saloon had faded. Leader of the adventurers was a bearded man named Ford. I told him I was an apprentice draughtsman at the shipyard across the river, upstream. He said they wanted to re copper the bottom for her forthcoming voyage to the tropic seas and I told them it was often done at the shipyard to the small wooden craft built there for the Admiralty. I suggested they try the yard without much hope they could afford it - or receive much attention or service as shipyards usually have better things to do than cater for such ocean adventurers. However to my surprise they quoted Ford for coppering the yawl. He almost collapsed at the realistic quotation – then asked the yard if they would sell him copper sheets, coppering nails, brown underlay paper and black varnish, the materials of coppering a wooden hull, then almost unobtainable for yachts. They did so and to my considerable surprise also lent Ford and his companions broad headed coppering hammers and a marking out board and punches to make holes in the copper sheets, through which the copper nails were driven. As they could not afford to have SILVER FOAM slipped the crew sought permission to lay her against a private quay at Wivenhoe on the top of the tide. I wished Uncle William had been there to see me heaving at the capstan handles, warping her alongside. I think he would have approved of my carefully tied bowlines. SILVER FOAM settled on the none too level foreshore and between tides Ford and his friends got to work having sought explanation of coppering procedure from some of the yard shipwrights, who were generally uncommunicative of such information to strangers. Somehow the bottom was coppered but as they approached the bilge things started to go wrong and the strakes of copper sheet were becoming irregular. A halt was called and Ford decided to spend some of their savings for the voyage on having yard assistance to finish the work. It was then the turn of the shipwrights to grumble as they slopped about in the mud and up ladders doing work usually carried out in a shed or at least on a relatively clean berth or slipway. Eventually it was finished and SILVER FOAM motored off downriver waving goodbye and was never seen there again. Details of restoration works are in the Restoration section below. In early 2000 her current owner, an author from London, took over the project and the work continued at the Penpol boat yard near Truro – also detailed below. It was an ink drawing - an illustration from a 1912 Yachting Monthly article - that first caught my eye in Classic Boat magazine. She looked like my ideal of what a yacht should look like .... Something often said about a Fife; fast, sleek.... beautiful. 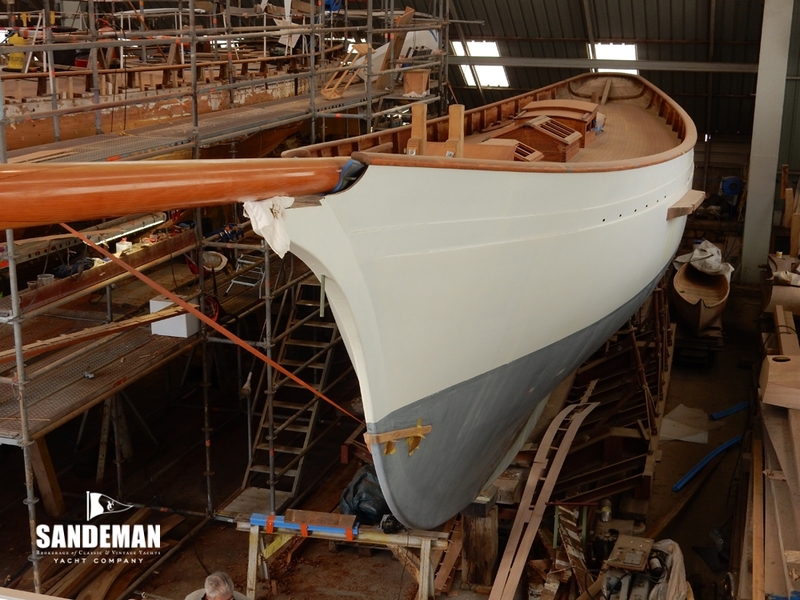 When I first saw the hull in a shed near Falmouth it was clear a lot of work was needed but it was also evident that a lot of work had already been done. Four brothers named Hamber had spent the better part of a decade painstakingly replacing each and every plank in her hull with a new iroko planks. 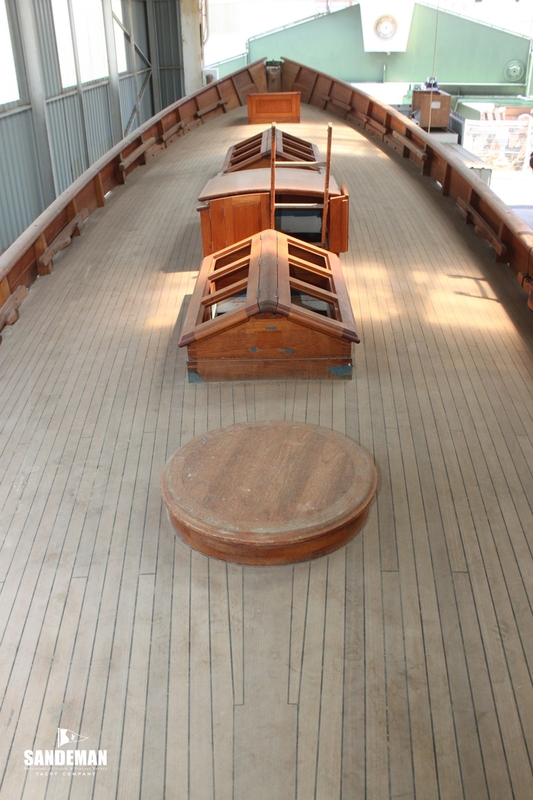 They had used West System epoxy and the planks had been attached by edge to edge gluing and by way of trunnels; wooden nails soaked in epoxy and then driven through plank and frame. It was a job of beauty and a labour of love. That much anyone could see but it was a hull, some original parts, lots of provenance and not much else. Although I had previously spent quite a few years restoring MARIA VAN DIEMEN a late 50s Sparkman & Stephens 36 built in double planked Huon pine for the Sydney Hobart, the vintage of COLUMBINE was not something I had any knowledge of and so I got in contact with the one person that did - and does; Alex Laird. I called him and we discussed COLUMBINE. He knew the boat and he agreed to consult on the project as marine architect, which he has now done for almost 17 years. On the very first trip to Penpol boatyard, Alex was very candid agreeing she was a beautiful hull, but he doubted the West System - edge on edge gluing and the trunnels would hold up to the rigours of racing. She looked good but as he explained; “a yacht such as this will generate extraordinary forces under full canvas, especially if you're racing”. Racing was definitely on the agenda and Alex understood very well from the very beginning of the project, that a stiff boat is a fast boat and all the work on the hull has followed this very simple but very expensive guideline. It was agreed that one of the first works, after manufacturing a beautiful custom cradle that she still sits in today, was to fasten all planks with aluminium bronze self tapping bolts. I don't remember exactly how many went into the hull but I know that many thousands were used; painstakingly countersunk and plugged. After this it was time to lay the deck. The first step, which took almost six months was to make the deck beams. For strength and resilience they were crafted in laminated oak on individually built moulding frames. Each beam was a work of art - and as strong as steel. Half the yard begged me to not paint them, which however is what we did nonetheless because that is how they would have been originally and apart from speed, authenticity was also not to be compromised. Next were the bronze knees. 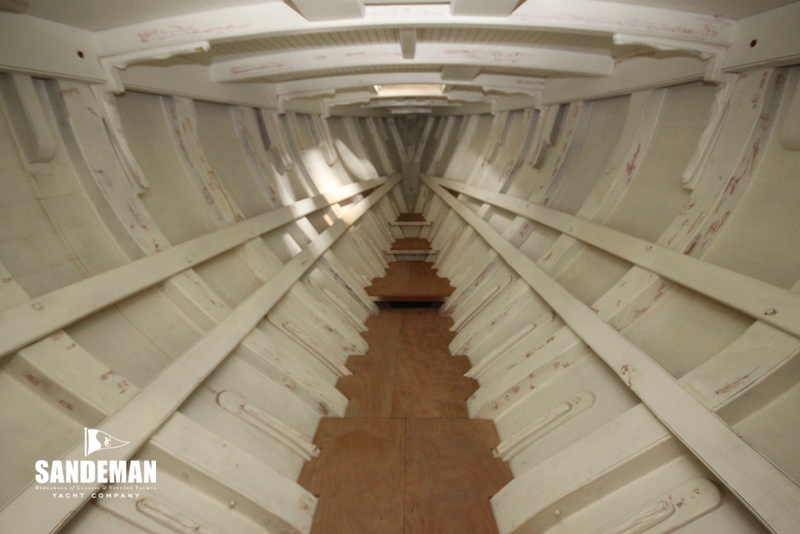 Again, they were all individually moulded and once installed; they too provided an additional element of stiffness as a reinforcement to ensure a stronger and stiffer bond between the deck and the hull. Finally came the deck itself. Again the construction method chosen was for the greatest strength and stiffness. 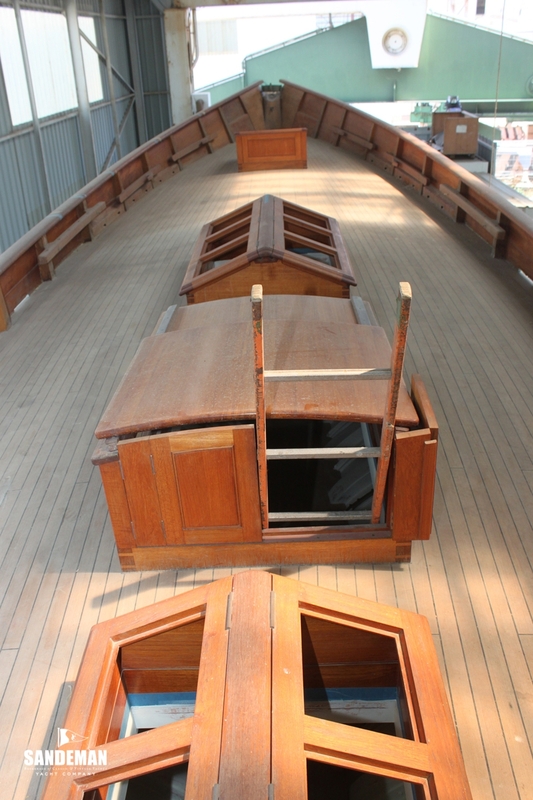 Originally she would have had a solid laid deck but deck planks, no matter how thick, move and twist under the strain of full canvas, reducing speed and compromising the integrity by allowing leaks, leading to issues of rot etc. Instead, a marine ply deck 1 ½ inches thick was laid and then another ¾ inch marine ply laid diagonally over that and on top of that ¾ inch solid laid teak planking deck. The total thickness of the deck is therefore three inches; a phenomenally stiff construction. 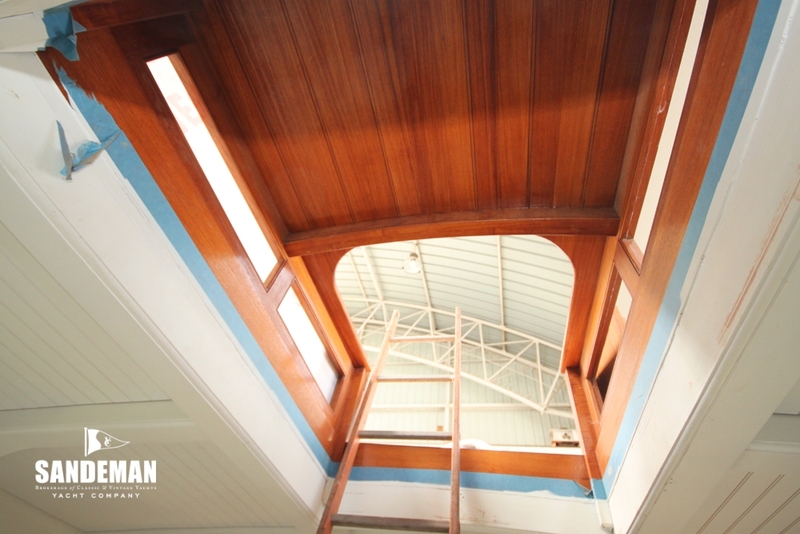 Quite a few years later, it was decided that, as COLUMBINE had been sitting in her cradle in the same spot inside Classic Works yard for more than five years, the new Iroko hull planks had stabilised to the extent that the hull was now the ideal textbook case for sheathing with epoxy. 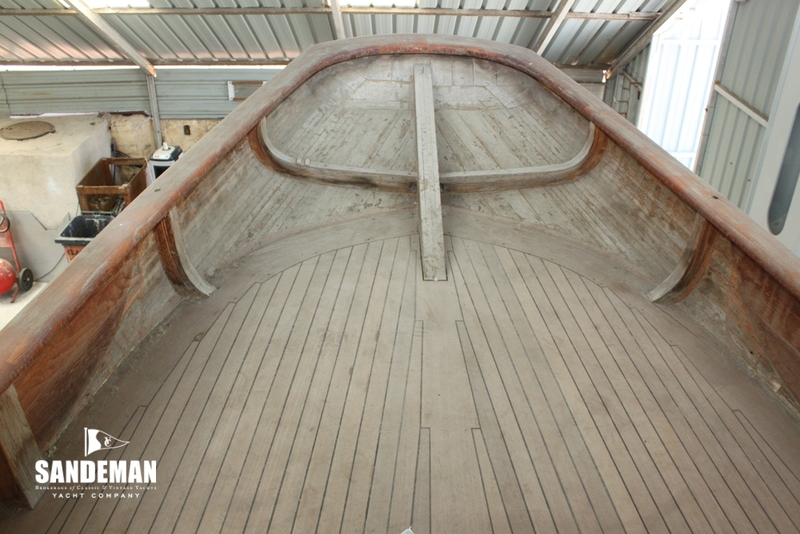 The timber to be epoxied was completely dry and totally stable; the optimum conditions for sheathing - seldom found so it was decided the hull would be sheathed - once vertically , once diagonally and once horizontally on the outside with epoxy impregnated Dynel cloth and sheathed between the frames on the inside of the hull in the same manner. 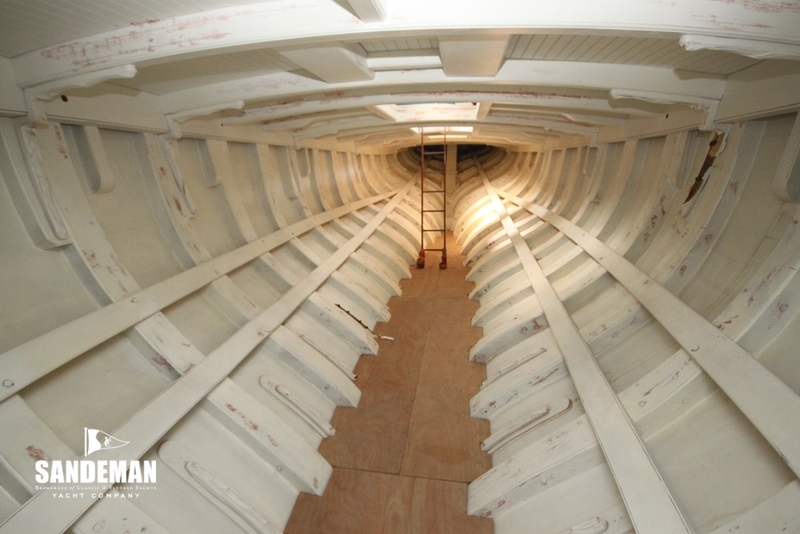 It was a massive undertaking that took many months of skilled labour but the end result is a hull that is as stiff as a monocoque and a bilge that will be dry. 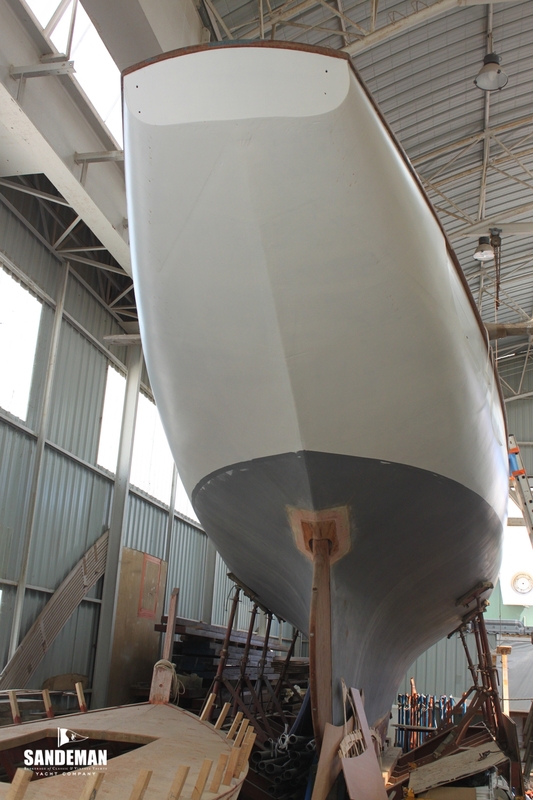 The lower edge of the cloth was tucked into the seam between the lead keel and the wooden keel and in 2015, after much discussion, a decision was made to also envelop the lead keel in the same sheathing. After first tightening the massive bronze keel bolts once more to ensure that the hull and keel are entirely integral, the low flat lead keel was sheathed in such a manner that there is now no point, anywhere on the hull where water could get in. Tests were done to achieve best possible adhesion to lead and only when a formula found that made the cloth stick irremovably was the project given the green light. Finally as was always agreed with Alex from the very beginning, we adhered to a plan where no holes have been made in the hull – none! Moreover none ever need to be, as the drive system uses Pod technology, the absence of holes continues even with a Port and Starboard drive system because the Pods are built onto the outside hull, covering the hole that provides the drive connect. This in itself will be a major contributor to hull speed as well as the now " legendary" stiffness of the hull.